I periodically rinse my outside unit with a garden hose, Why am I not seeing a significant difference in its lifespan? Washing down your outside condensing unit is one of the best things you can do. This simple act will reduce salt concentration levels on the unit and slow down the units natural degradation. Unfortunately, though, fresh water alone doesn’t have the necessary properties to achieve any significant level of salt removal. Air Conditioner Salt Remover is engineered to empower your wash-downs; simply making the process simple, yet affective. How simple is Air Conditioner Salt Remover to use? If you can operate a garden hose then you can do this. It’s simple, non invasive, connect to any garden hose and follow the directions. How often should I use A/C Salt Remover and How long will one bottle last? Under normal coastal conditions, begin use at intervals of once every three months with frequency being reduced or increased according to your specific results. When used in accordance with the directions, one 32oz bottle will provide up to 3 months of sea salt removal treatments – Up to and including a 5 ton unit. How long does it take for my A.C. to be affected by salt? The efficiency of your A.C. unit is affected shortly after installation. The salt and its hygroscopic nature work to insulate the outside coil and reduce thermal transfer. Daily salt build-up greatly reduces the heat transfer that must take place for your unit to operate efficiently. The actual degradation that renders the unit useless can occur in as little as 3-5 years, depending on your location. My outside unit looks pretty rough. Should I wait until the system is replaced with a new one to begin using A.C Salt Remover? No! Think about it…When are you going to replace your system? Yeah, that’s right! When it goes out! No matter how bad your outside unit looks, if it’s still operating, using A.C Salt Remover now will increase your systems efficiency. Reducing Your Energy Bills Now! I have a warranty on my A.C., shouldn’t it be covered? Most A.C. units are equipped with a 10-year parts and labor warranty. However, the warranty does not cover breakage due to corrosion. Most disclaimers will note that units situated within a salt air (coastal) environment are not covered. How long should my A.C. last? Manufacturer’s standard on A.C. or heat pumps is 10 years, with units lasting upwards of 15-20 years. While an average coastal unit can be replaced in as little as 3 to 5 years due to salt corrosion. Is there a difference between a heat pump and an air conditioner? Yes, although both systems are equally affected by the presence of salt that is common to the coastal region. No matter which unit you have the salt air is still diminishing the life and efficiency of it. How can I tell the difference after using Air Conditioner Salt Remover? You can perform a simple test to see the instant benefit of using A.C. Salt Remover. Allow your A.C. to run continuous for about 10 minutes. While the unit is operating take any type of thermometer (be sure it is capable of measuring 0°-100° F). Place the thermometer in front of the vent blowing out cold air that is closest to the thermostat. Allow it to monitor about 4 minutes. Record this temperature reading for comparison later. When completed, while the unit is still running, place the thermometer to the outside of the return (where the filter goes inside your home). Allow it to monitor about 3 minutes. Record this temperature reading and compare with the early reading. An A.C. unit that is operating mechanically well, “Salt-Free” should have a difference between these two temperatures of at least 15° to 21° being the maximum difference. 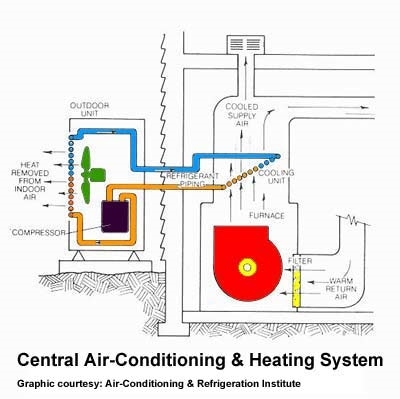 Example: Conditioned temp is 51° at the vent; 72° at the return. Now shut off the unit. Apply A.C. Salt Remover following the directions on the bottle. Turn the A.C. back on and allow to run a minimum of 30 minutes to an hour. Then perform the test again. THE RESULTS WILL AMAZE YOU!! This test reveals the significant effect sea salt has on the efficiency of your unit. Please view our Case Study Service Div. My unit is equipped with a coating from the manufacturer to protect my coil from the harmful effects of salt. Do I need to use Air Conditioner Salt Remover? YES!! Although your unit has been coated with a protectant, the salt still accumulates on the coil, which added to the restriction of the heat transfer already being created by the protective coating, can lead to substantially higher energy consumption. My air conditioner is ready to be replaced. What type of unit should I replace it with? We recommend replacing with a high efficient unit that utilizes the spine-fin configuration for the outside coil. This design reduces points of contact between the aluminum and copper refrigerant line, minimizing galvanic corrosion. The benefits of Air Conditioner Salt Remover will allow you to enjoy the latest energy savings technology without the fear of salt prematurely destroying your unit and reducing it’s efficiency. How far from the coast does salt air affect my air conditioner? Typically if you live along the coast up to 3-5 miles inland, salt can affect the life and efficiency of your air conditioning unit. © 2019 Salt Removers Corp. · Website by Marketblazer, Inc.